Coni and I have set a date for our wedding: Saturday, September 30th. We are tentatively planning a late afternoon wedding at the Catholic church in Osakis, followed by a reception at the Elks Lodge in Alexandria. Now comes the fun of planning flowers, tuxes, dresses, music, invitations, decorations, photos... What am I forgetting? Many things, I'm sure. But now that we have the big decisions taken care of we can start concentrating on the details! Coni is in Maryland this week for another cycle of chemotherapy. She did not have any CT scans or other tests, as they decided to wait six weeks between tests this time. So her next scan will be three weeks from now. Despite not having to go through the usual battery of tests, Coni had a long first day at NIH on Wednesday. The nurses had a tough time getting her PICC line (similar to an IV) in place, so she ended up spending much of the afternoon being poked and prodded like a pincushion. Or maybe a voodoo doll. Either way, it did not make for a fun day, but the rest of the week has gone more smoothly. She will be returning to Minnesota on Monday morning. Please keep Coni in your thoughts and prayers again this week. You can send e-mails and e-cards to her here: c_waltzing@hotmail.com. 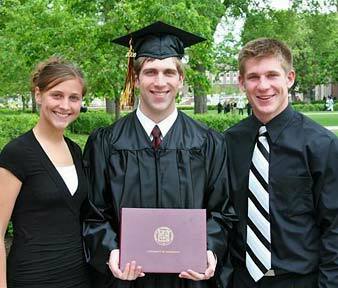 Ryan collects diploma, left; Lindsay, Ryan & Brandon Hellevang, right. I'm taking it easy for the next couple of weeks; just enjoying having some down time and few responsibilities. We're going to be picking up a new Ocicat, probably on Monday. We'll need to travel down to Omaha, Nebraska, to get her. It'll be a slight road trip. I leave for Chile on June 7 and will be down there until the 30th. I move into my new apartment at the beginning of July (I'm all grown up!) and then go to Dallas for two weeks for training. After Dallas I head to Orlando for a week, back to Fargo for a week, then off to Seattle for a week. I'm an International Man. I bought new luggage yesterday to handle all of this "on-the-go"-ness. Feel free to leave comments on my gallery or my blog. You can also view Jessica's Chile blog at: http://missmay.wordpress.com. Thank you all for your rapt attention. Dismissed. Jessica had surgery on May 4th, to put rods and screws in her back for scoliosis that just kept progressing. On May 11th she came home from the hospital, doing great, but very bored and somewhat sore. It's been hard to convince her to eat or drink much as she doesn't have much of an appetite; she has been asking to go to get a cheeseburger, but we are really trying to keep her on a wheat-free diet, because of her allergies. (Thanks for the timely update on making spelt bread, which I've been researching, but haven't had time to make!) I'm sure she'll be eating more soon. Since no position is comfortable for very long and her attention span isn't very great, it's been hard to keep her occupied. She thinks it's very boring at home without video games and many movies! It's amazing how fast kids recover; she's already dressing herself, and walks well. At this point it doesn't look like she will need more physical therapy for her back. It's been awhile since we've checked in! We continue to enjoy watching the changes with Mason. He literally changes every day. He's getting to be a big boy. He was 8 lbs. when he was born (on March 30th), and last week when I went for my 6-week check-up, we weighed him with his clothes on, just for fun, and he weighed in at 13 lbs., 6 oz., so he is really growing fast! I went back to work Monday and continue to work two days a week at the bank. Mason's first day at day care went fine, and mom was okay too! Ben is still enjoying work at Kimley-Horn. These days he's been on a job site as Special Inspector, so he's been having fun being out of the office for a bit. 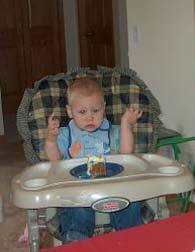 Tyler's unsure about birthday cake, left; Shari preparing food, right. Tyler's first birthday party was on Saturday. About 35 people attended. It was a wonderful time. Tyler got lots of presents, even though it was a "no presents" party. Grandma Shari came all the way up from Florida to help celebrate Tyler's birthday. Jordan and Tyler were baptized on Sunday. It was a wonderful day. The service was beautiful! Jenny came from Minnesota for the baptism and of course Grandma Shari was already here. A HUGE thank you to Mom for all of your help with the party, baptism and making our Mother's Day very special! 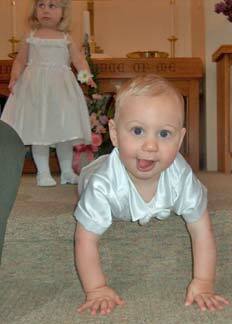 Jim, Jordan, Kristi, Tyler at baptism, left; Tyler playing on stairs, right. Mother's Day celebration in Alexandria. 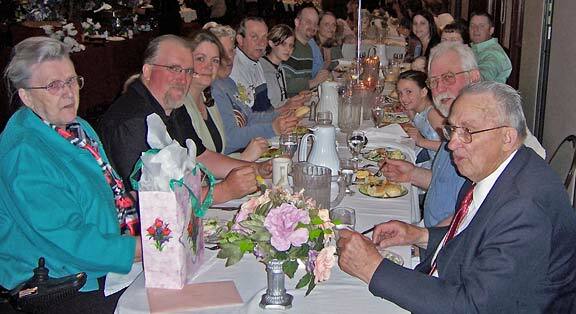 We had a nice turnout to help celebrate Mother's Day, gathering at the Holiday Inn in Alexandria again this year. They had quite the spread, with three huge areas full of people. Each area was decorated with "Happy Mother's Day" balloons, candles and nicely set tables. The mothers in attendance were: Dorothy Anderson, Shirley Ostendorf, Patty Anderson, Rebecca Chap and Donna Johnson. Spring is here, summer vacation is coming up quickly, and the end of year activities are happening! Last week we had the first of several spring events: the concert. This week on Monday Jayce's class took a field trip to the Zoo in Wahpeton, which was a big hit! Wednesday forenoon I had a chance to take four of the daycare children in and watch Jayce in his field and track races. In the afternoon, Beaver stayed with the three that were napping and I took the older boy back with me, to watch Caity in her races. The weather cooperated, other than a stiff breeze; it made for a fun day outside. I do have a pink face to show for it (even though I used some sunscreen). Jayce participates in spring track meet. 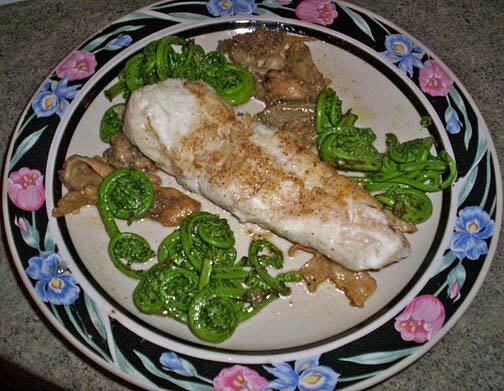 Alaskan Halibut with Oregon Morels and Fiddlehead Ferns from California. I feel we accomplished a beautiful tribute to our mother, Amy Mellon Dake, and I am so pleased that so many helped in the effort. Thanks, EVERYONE! I did have a very wonderful Mother's Day observance and I hope all of the rest of the mothers in our midst did, too. Thank you thoughts go out to my whole family for remembering me with meals, gifts, flowers, cards, and phone calls. Thanks to Don and our children and grandchildren. This is my belated Mother's Day meal that Chef Douglas prepared for us today. It was a a very "health minded meal" -- the only oil used was olive oil. It was a delicious salute to the Pacific coastline of the USA: Alaskan Halibut with Oregon Morels and Fiddlehead Ferns from California. 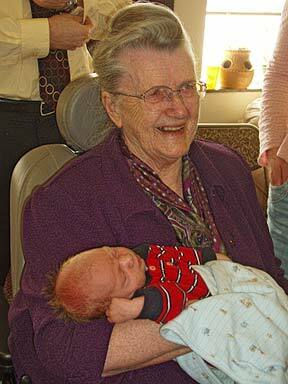 Mason Taylor Henderson with Great Grandparents, Dorothy & Don. No problem GUESSING this week. Surely that is LeRoy Dake. I like this picture because it shows the gate to Grandma's flower Garden. 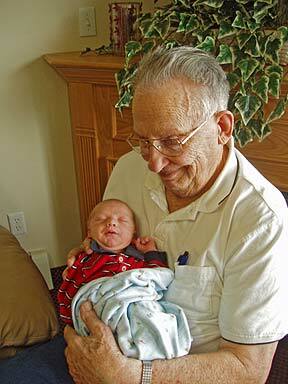 LeRoy Dake is the young man in the picture. WELL, I had some guesses on the car -- but Ken said, "Now if the whole car was here I could tell you if it was a 29-30 Chevy..." but, of course, that is the FUN of the guessing. I am sure I will be surprised to know who the gentleman is and WHAT is he holding in his hand? Many things were guessed as we studied the picture ---- hmmmm. One Sunday morning we barely made it to meeting. A U-joint was about to go out on the truck. It shook, rattled and clunked. But, by driving slower, and with more care than usual, we made it to the meeting, albeit a little late. After the meeting a Mexican-American family invited us over for a traditional Mexican meal. The lady of the home was a busy judge at the courthouse in town, but she hadn’t forgotten how to cook! 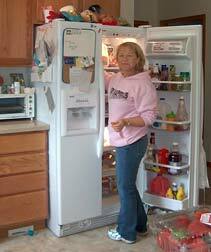 She and her husband, also a skilled hand in the kitchen, put on a wonderful meal. After the meal was over and dishes were done, the man of the house volunteered to get us a new U-joint from the "closed" parts store in town. After we got the replacement part, he helped put it in -- a good thing, as he was handier with the tools than I. Meanwhile, Sherry had written a letter home. After we "mechanics" cleaned up, we and our families all went to the four-o'clock gospel meeting. When the meeting was over, my family, including Checker, stopped at the Safeway store to get groceries for the coming week. Sherry was to start cooking for the lambing crew the following day. Our groceries filled three carts heaping full. The store was happy to pack it all into boxes so the goods would survive the long ride home, in the back of the pickup. Although the last fourteen miles of our trip had long stretches of mud, what wasn't muddy, was boulder strewn. We frequently got flat tires from driving over these boulders. I had the regular spare tire, bolted under the truck, and two more spares in the back, under the toolbox. On this occasion, we used all three spares before we got back to the ranch. Changing tires in the mud, the cold, the wind, and the dark, using a handyman jack and heavy-duty tire iron, may have brought me to my long-standing conclusion that wearing dress pants is a total loss! 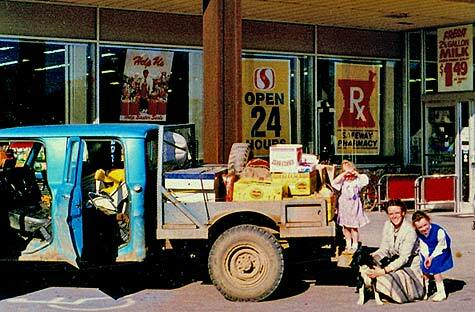 Sherry, Sarah, Amy & Checker, loading up a week's groceries. I happened to sit down at the computer to try to make a dent in my e-mails and clicked on your article about Uncle Edward's inlaid wood hobby. I'm wondering if I possibly have one of his pieces! I'm attaching a photo of a tray that I remember always hanging somewhere in the house as I was growing up. I don't remember any history of it, other than it was made by an uncle somewhere in the family. I, too, would love to know what happened to the tables described in the article. Would you have any idea if he signed his work or somehow identified it? Inlaid tray made for E.W. Miller's niece, Marjory Johnson Knowles Chrisman. 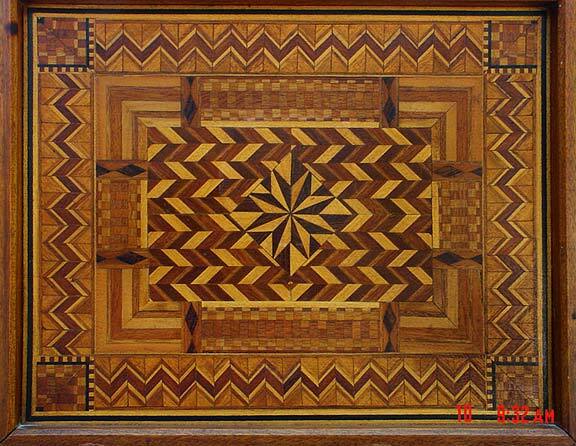 Edge detail in early inlaid wood tray shown above, date unknown. I was so pleased to see the picture of the [above] tray. I think it must have been an early one because it is much more elaborate than any we (Hugh, Grace and I) had. I'll try to tell you a little about Father's woodworking. Except for the sofa, he built all the furniture in our house in Ontario, including a beautiful walnut bedroom set and walnut dining table and chairs. Each of us children received some of these pieces when Father died. I have Mother's secretary, an occasional table and a plant stand. In addition, Father made furniture for each of us when we married. He made my maple coffee table and end tables as well as a cedar chest and double chest of drawers. He did the same for Grace. My son Bill now has the cedar chests and the double chests. He also has a desk that Father made for Lonny [Ruth's late husband]. You asked about the inlaid tables. I have a dark mahogany card table much like the one in your picture. I also have an inlaid coffee table. One of the library tables went to Dr. Emmons, our family doctor, to pay our medical bills, and Grace had the other one for many years. When she died, it went to Lon, my oldest son. Some of the other inlaid furniture that she had went to Hugh's son and daughter. I was so pleased to see that Bulletin article [about the inlaid wood tables, in Bulletin 203] because I don't have a copy. I did find another one in Mother's scrapbook, one that has Special to The Christian Science Monitor under the title. Unfortunately, it doesn't have a date either. Because it says "Two years ago, when contracts decreased," I would put it in the early 1930s. I know Father would be pleased about your interest in his work. Two of his pieces that I especially treasure are a little turned bowl and a covered stamp box. He told me that he turned them from an oak log that came from his grandfather's log cabin. This must have been from his Grandfather Neller, so I assume it was a log cabin in the Austin area. Do you think that is correct? I haven't done as much research on that branch of the family as I should. Were they farming in that area? Can you tell me any more about them? Greg and Sonja Dake left Durham, North Carolina, for Shanghai, China, on January 6th and returned January 28th. It was a business trip for Greg and Sonja went along. They took extra time for sightseeing while they were there. 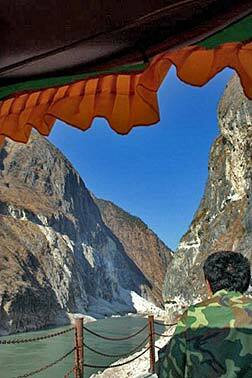 View from rickshaw, left; mountainside, Tiger Leaping Gorge, right. Our first order of business was not to go check in at our hotel, but to make the two hour drive to visit Tiger Leaping Gorge. We drove there on twisty winding roads that were pretty well maintained and obviously pretty new. The view out the van windows was quite interesting. Traditional Chinese buildings with the pagoda-type roofs, but adapted to the semi-tropical environment of the area. Dirt floors on most of them, and we drove through some villages that didn't look to have much in the way of electricity or running water, etc. We soon began seeing cows tethered outside homes by rings through their noses, pigs and chickens wandering around loose, horses tied to trees on short ropes, etc. The main mode of transportation appeared to be small trucks with exposed riding lawnmower motors on the front. Two-cylinder engines putt-putting along. The road was well-maintained but very twisty, and I soon realized there was one over-the-counter medicine we hadn't brought along but should have -- Dramamine [for motion sickness]. The first hour of the drive I was looking out either side of the van enjoying the scenery; the second hour I was looking straight ahead with only quick glances to the sides at the scenery. We got to the parking area and entrance to the gorge around 4 p.m., and they closed at 6 p.m. The guide said it had been a windy day and there were some reports of rock slides; if we wanted to take the 2.5 kilometer trail to the gorge, it was recommended we hire a rickshaw. So we did. It was nice not to have to walk up on our own, but there were pictures we wanted to take that we couldn't. So we didn't complain about the rickshaw leaving us at the top and having to walk back down later. The scenery was just breathtaking; it's too bad the pictures we took just can't show the scale or the real beauty of it. Boulders the size of school buses had fallen off the mountain onto the river banks. (The Yangtze starts near the area and takes the "first bend," which sends it north through China, instead of south and avoiding China). The rock that gives the gorge its name is a huge boulder in the middle of a narrow section. 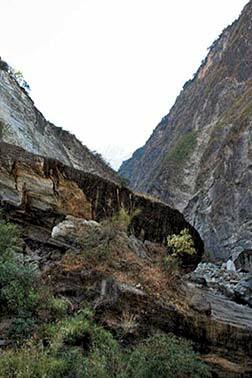 Local legend has it that a hunter chased a tiger to the river's edge, and to escape, the tiger jumped to the boulder and then to the other side of the river, so the rock is Tiger Leaping Rock and the gorge is Tiger Leaping Gorge. We took quite a few pictures in spite of the lowering sun's glare; some of them turned out pretty good, we think. On the walk back to the van, we took more, including some we wanted to take on the way up but couldn't. I picked up a few small pieces of quartz along the way, with thoughts of making them into earrings/ necklace pendants some day. Or to just keep as souvenirs. On the way back, we also saw the evidence of a few small rockslides that had happened after we'd passed. One spot had park employees deliberately knocking loose rock down onto the walkway, in a controlled slide rather than leave it to chance. Once back to the van, we repeated the two-hour twisty drive, back to the town of Lijiang. On the way out of the gorge area, we were flagged down by a guy with a cell phone, drawing our attention to the rockslide that was happening on the road ahead, and not one that was man-made. We had to sit and wait for it to subside before we could leave. Greg leaned out the van window and took a picture of it. Two hours or so later, we checked into the hotel and decided to eat dinner in the restaurant there rather than go back out. Thus the adventure of the fake four-star hotel began. That's a good place to start a new entry, though, so I'll end this one for now, to keep entries at least a little shorter and hopefully more readable. Rian shops for summer flowers in the garden center. Hallo, yes, here is a small note from Oosterhout. I have been busy lately -- much work and very busy at work. Summertime here in Holland and so a lot of sea-containers from Rotterdam port to a large shopping center here -- where we are working with garden furniture -- 25 to 30 a day all with seats, tables and a lot of those kind of stuff. I have worked the last six weeks, six days a week -- weeks of 74 and + hours. I know at the end of the month it brings a lot of $$$$. Last Saturday evening we had a BBQ from the boss because we have shown a good work mentality. 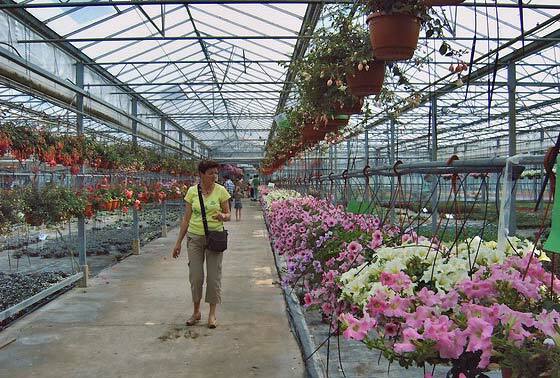 On Saturday we went to a garden center (Rian and myself) for some new summer flowers. I have made a few pictures of that center. I don't have any pictures taken from my own birthday. I was that day at work and was sleeping in the Rotterdam Europoort Container-port. I worked that day a total 16-1/2 hours and was unable to get home on time. The family has been eating up the birthday cake. (Oh, what a pitiful story -- hahahahaha.) After 54 years it doesn't matter much if you have cake or not. I hope that you are in good health. OK, make the best of it! P.S. It was nice to read that you like my spring flower garden. 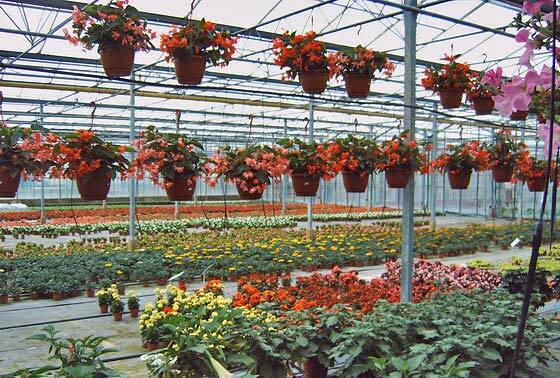 Colorful displays of summer flowers in a garden center in Holland. 2. Saute onion and celery in the margarine. 3. Add the broth and soup and simmer for 5 minutes. 4. Add rice, chicken, and soy sauce and pour into 11 x 7 inch baking dish that has been sprayed with non-stick cooking spray. 5. Bake until bubbly and brown, approximately 30 minutes. 6. Remove from the oven and sprinkle with cashews and noodles. 7. Bake 5 minutes more, then sprinkle with green onion before serving. Yield: 4 servings; 180 Calories, 6 W.W. points per serving. Click here for the Skinny Recipes collection. Thank you very much! That was very cute! We're going to celebrate Friday night, so we'll see about a picture. 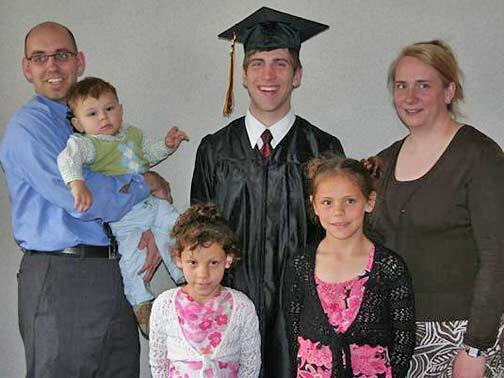 From left: Brandon, Lindsay, Ryan, Merna, and Ken Hellevang. 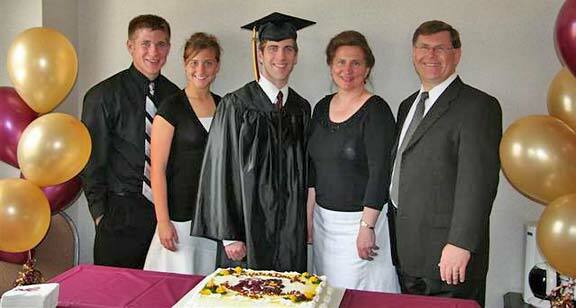 Ryan Hellevang was graduated from the University of Minnesota's Carlson School of Management on May 14, 2006, with a Bachelor of Science in Business. 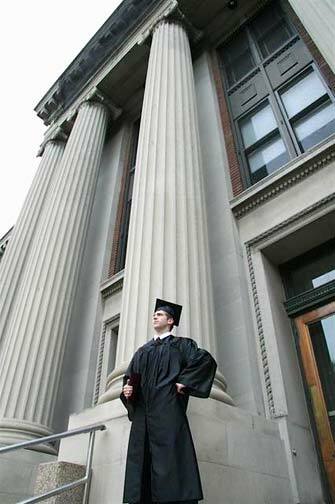 His majors are Management of Information Systems and Supply Chain Management. Ken, Merna, Brandon and Lindsay traveled to Minneapolis for the graduation ceremony, which was held at the very stately Cyrus Northrop Memorial Auditorium on the East Bank of campus. From there, our family went to Grandma's Restaurant where we met Troy, Marlee, Alyssa, Angelique and Jettison Freesemann for lunch. Some of Ryan's friends, and also the Freesemanns, joined us at a cake and punch reception at the Holiday Inn - Metrodome that afternoon. We also packed all of Ryan's belongings from his apartment into two mini-vans and moved him back to Fargo. 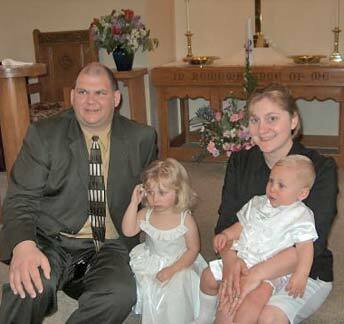 From left: Troy Freesemann, holding Jettison; Ryan Hellevang; Marlee Freesemann; Angelique Ann & Alyssa Freesemann in front. Isn't that just great! 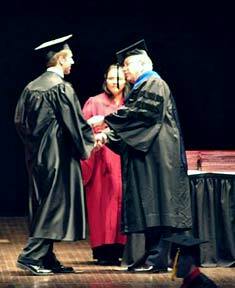 The boss's nephew Ryan Hellevang is now a college graduate! And aren't these nice family pictures? I love the joy expressed by them all! I wonder if there aren't some others of the relatives and friends among The Bulletin subscribers who will graduate this spring, if they haven't already. I hope they don't forget to let us know! A nice photo or two makes us feel like we were there! WOW! That's all I can say. The Grandma Dake tribute was very moving and amusing, perhaps the finest thing I have seen in The Bulletin in a long time! I laughed out loud and got a lump in my throat several times. Kudos! That was a moving, BEAUTIFUL tribute to a very special lady! It was a three Kleenex read for me, however. :-) In spite of that, I LOVED it -- what an awesome idea you had. I didn't want to read it until I could savor every person's input, so didn't get to it until this evening. It was worth the wait! Shari called and she said, "It must have been the day to water my contacts!" and that she cried a "bucket of tears" when she read it ... so, I'm sure it touched many others the same way. Thanks to all of you who worked so hard to put this latest Bulletin together. I think everybody would agree that it was a giant success! While reading the tribute, more and more memories kept flooding my mind. I'm just wondering if there's anybody in this world who can call cats to dinner the way Grandma did? Try to do it yourself. Bet you can't. Thanks for an A plus, over the top production. Editor's Note: Thanks, Mar -- that was a very encouraging note! And no, I never did learn to call cats (or chickens) the way my Mom did! What a nice, beautiful tribute to "Our Mom." Thanks, Dorothy, for all your time to put it together, and thanks to everyone who added their thoughts and remembering of Mom Dake. Nice to see the messages from all around the countryside. Editor's comment: It was indeed a group effort, with many involved: The photographers, the illustrator, the photo editor, the editor, and the contributors! And it was surely worth all of the effort that went into it! Thanks -- from the Matriarch. On a humorous note, Amy would take us out to the Norseman in Cokato after Sunday Meeting for dinner and when it came to go, she said, "I forgot my pocketbook." Of course, we were glad to pay for her meal. (I had many good meals at her home, cooked by Amy.) We used to give her a good natured ribbing about this, which she got a chuckle out of, too. 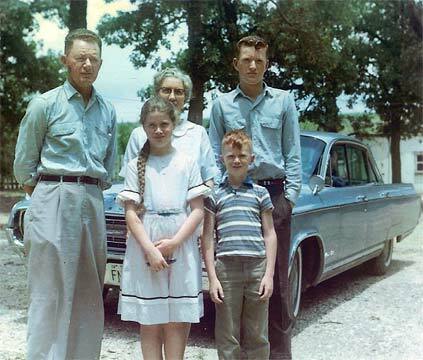 We had her and Bill along on a few long trips, to Texas and Colorado, to visit relatives. Enjoyed every day of it. Bill made sure everything was fair in sharing the expenses. IT WAS HERE BEFORE I EVEN HAD A CHANCE TO GET ANXIOUS! WAY TO GO! I nonchalantly checked the mail, and about jumped off the chair in surprise that it was already here ... and not only ONE but TWO. Talk about worth waiting for, except this time it waited for me! It is printing, but I peeked at the first pictures, seeing it was to be a surprise, and I was not disappointed. There was Amy, the Queen Mother, all fixed up by Bitzi in her purples ... and there was our Coni and her never failing defender, Weston. So touching, so beautiful, and so fitting. What excitement ... Weston and Coni are engaged; however, their lives have had a binding process for a long time now, and this is just the public expression of what we've seen all along. Total love and devotion and caring through all the ups and downs and ins and outs and over and unders. A solid foundation for what will be theirs in the future. We are so happy for them. And we wish them well in all their planning. If Gina and Dan are any indication, togetherness as "Mr. and Mrs." is the extreme of happiness, as far as this natural life is concerned. When I saw the "wedding" with Dorothy as the bride, it was just about what Amy would have been doing, too. She reminds me so much of Amy in her interest and love for her family, and in her love of fun even though being in a wheelchair has curtailed all she'd love to be a part of. I caught my breath when I turned the page and saw those blue eyes again. 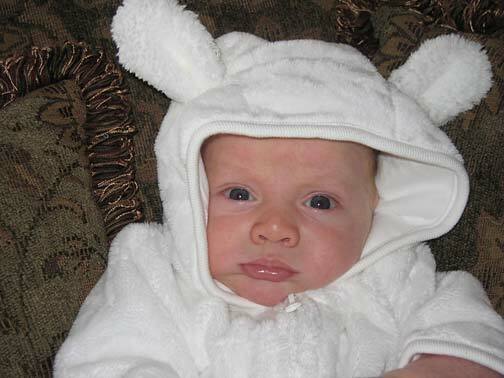 It's been a long time since Sully has been in The Bulletin, but those eyes still have the same beauty and innocence. Please send us updates as they happen while Sully grows up. Did I see an "automatic milk bottle" in the steering wheel of his little car? Cute! No matter which baby animal it is, they are so cute. Like the ducklings. The girls in their "dress ups" are just a little glimpse of only a couple more years down the road. Now that would have taken weeks of preparation to produce such a keepsake issue as the Tribute to Amy Dake. It just came naturally to open our hearts' memories to send you all the comments recorded there. Over a whole lifetime, their regard did not change for her life before them and with them, and even beyond the children and grandchildren to all her many friends -- they all felt the same awesome respect. Thank you for whatever it took to give us that precious Tribute with all the carefully selected and well placed pictures representing the years. We need another update from Kjirsten, in Texas, as she faces the grueling life of studying to be an MD. We were glad for some more details of the China trip ... remind me not to take that airline with the Chinese food! What a culture shock for them to come to America. Now Cuban Shrimp Stew looks a lot better to me! We missed you, Larry, but hope for better days ahead. Thanks for the interesting things you HAVE written, and we know there are lots more we will enjoy eventually. We expect Jerrianne will have some pictures of the woodworking in future issues. For a minute I thought that was Miss Kitty that Jack had on his arm, but they must have a cat named Puddy. Or am I missing a joke? Thank you so much for letting Roy and me be subscribers to this one-of-a-kind BULLETIN. Photo Editor's Note: Mike and Sarah and Levi Steinhauer might recognize "Puddy" as their cat, "Boots." 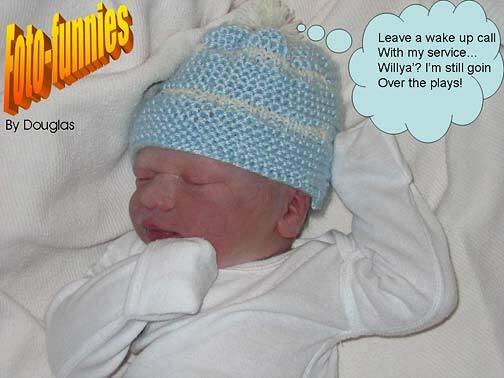 Ginny McCorkell "borrowed" a picture of Boots to create a visual joke with Photoshop Elements. Thanks, Ginny ... and "Puddy" ... also known as "Boots." Pretty cute ... and funny!